Odysseyware®, NWEA®, and Personalized Learning – Oh My! Our Always Improving series provides insight to our ongoing commitment to Odysseyware® educators and our learners, to demonstrate our dedication to providing innovative, up-to-date, and relevant curriculum and learning opportunities for students, and support tools for students, teachers, and schools alike. We are committed to keeping our curriculum and instructional technology ‘refreshed’ for today’s schools in a dynamic digital environment. Ask not what you can do for your data, but what your data can do for you! Maybe that’s a little dramatic, but the point is that there's an easier way for us teachers to get data in our hands more efficiently, and in turn, make decisions on how to personalize instruction for our students far more quickly than it takes us to do it manually. When you get data back – whether summative or formative – how do you disaggregate it? How granular can your data get when showcasing each student's strengths and challenges? How do you then create an individualized learning path (ILP) for your students? How do you address IEP’s? Where do you look for resources to create ILP’s? If even reading these questions causes you to stress, you’re not alone. As teachers, we spend countless hours outside of our classrooms and eating up valuable planning periods, trying to figure about the best way we can provide targeted personalized learning based on each of our student’s strengths and challenges. But what if I could show you a solution that is the result of an Odysseyware® partnership with NWEA™, that could minimize sacrificing your own family time AND provide a way that you can disaggregate data quickly, make informed decisions, and easily provide targeted personalized learning for your students? Let’s unpack what the Odysseyware and NWEA partnership means for you. NWEA stands for Northwest Evaluation Association® (NWEA™). NWEA is a research-based, non-profit organization “that supports students and educators worldwide by creating assessment solutions that precisely measure growth and proficiency…” Over 50% of schools in the U.S. leverage NWEA and their presence is seen in 145 countries! MAP stands for Measures of Academic Progress® (MAP®). MAP is an online, adaptive assessment developed by researchers, educators, and psychometricians, that is meant to be taken two to three times per year and is aligned to state standards. MAP pinpoints areas of academic needs for educators to make informed decisions and create personalized learning plans for students. MAP is used to inform decisions around reading, mathematics, and English language arts. It measures student progress, calculated student growth, projects proficiency on high-stakes assessments, and allows administrators to compare student growth to others across the country. It is different than a state end of year test in that it provides a ‘snapshot’ of how a student is performing – in that moment of time – regardless of grade level, rather than the state summative assessment that provides a grade level view of student performance. Odysseyware is a proud partner of the Northwest Evaluation Association® (NWEA™). Educators who administer Measures of Academic Progress® (MAP®) can now import test results into Odysseyware to generate individualized learning paths. These sequences of instructional content match students’ current achievements at all grade and ability levels and help foster growth that can be tracked through additional MAP testing. NWEA's strategic alliance with Odysseyware enhances a district’s capacity to take action on rich MAP data, extending the teacher's reach to help students grow as never before. These opportunities to help schools increase their effectiveness are what led Odysseyware to develop its MAP-informed individualized learning path (ILP) solution. NWEA partners to upload their assessment data into Odysseyware to generate individualized learning paths. 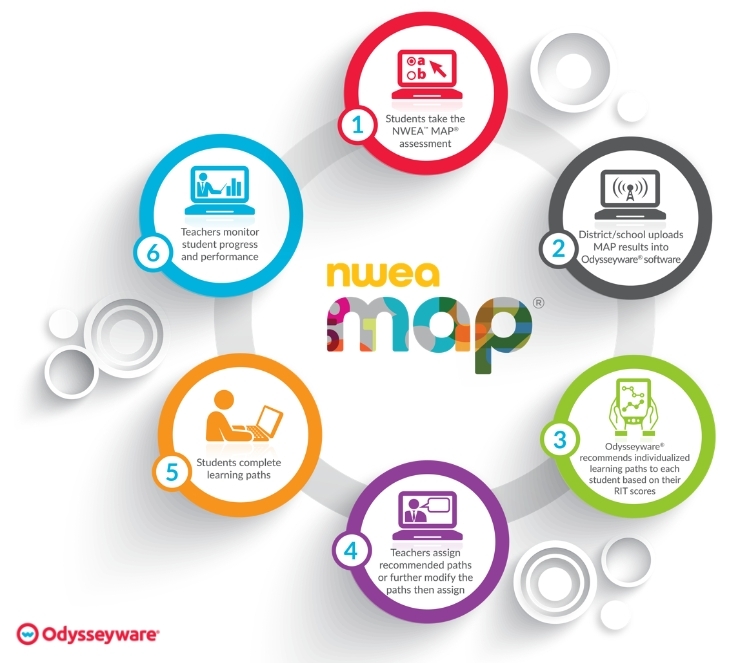 Odysseyware’s alignment with NWEA MAP combines unprecedented insight into student performance with powerful tools to ensure that students receive efficient and targeted instruction based on their specific strengths and challenges. Students take the MAP test that teachers have administered. Teachers upload the test results into Odysseyware. 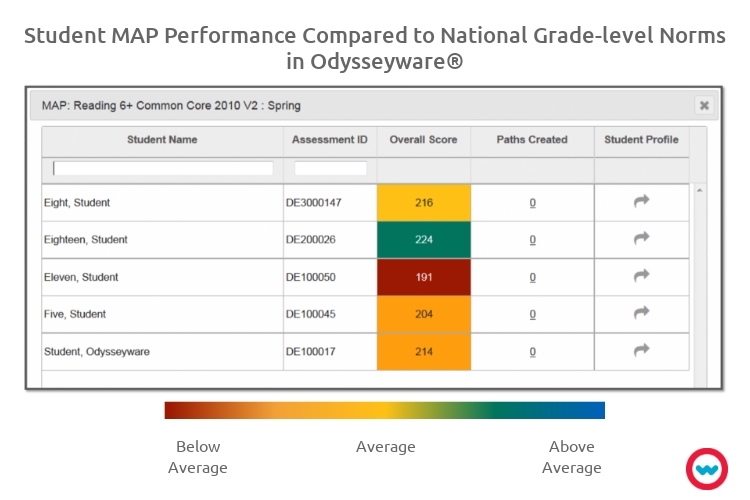 Odysseyware color-codes MAP test results to show student performance in relation to grade-level norms and provides an easy way to identify and prioritize the students who need the most support. Odysseyware recommends an individualized learning path, based on the visual learner profile that highlights areas of strengths and challenges for that student. Teachers continuously monitor student progress and performance. Odysseyware is committed to helping teachers and administrators make sense of – and the most of – student data. This includes our commitment to keeping our curriculum and instructional technology ‘refreshed’ for today’s schools in a dynamic digital environment. Therefore, you can expect to see updates to our NWEA MAP support this fall when NWEA releases their updates! Engage with an Odysseyware expert today to learn how our partnership with NWEA™ is changing the way teachers disaggregate data quickly, make informed decisions, and easily provide targeted personalized learning for their students through customized, individualized learning paths!